The Ingalls family has settled in Minnesota now, living in a dugout house, then in one with real wood boards! We listened to 2/3 of this driving to Oklahoma City and back for Capitol Day on Monday, and now the kids have finished it! 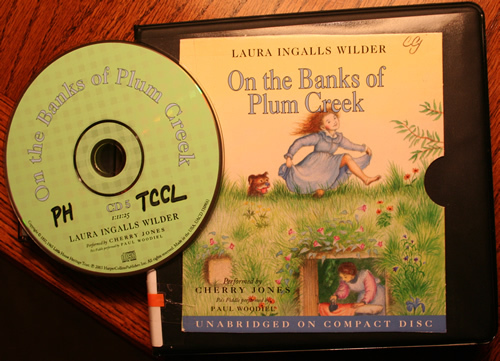 They listen at night on CD, so I am always a bit behind, but I only have a few more chapters to go. 1. “A couple of hundred miles don’t amount to anything!” he said. – This is after the grasshoppers eat the entire wheat crop, Pa has no money to pay back what he borrowed for the house, and he has to walk 300 miles to find work to get enough money to get the family through the winter, all in his falling-apart boots because he gave his last $3 for the church bell. I mean, really. And we complain when someone cuts us off in traffic? 2. Then Ma said, cheerfully, “We have to take care of everything now, girls. Mary and Laura, you hurry with the cow to meet the herd.” – This is after her husband just left, walking, to find work, and she is left alone with her three children on the grasshopper-ravaged prairie. By herself. With no Wal-Mart down the road, and no way to even get into town. My goodness! What fortitude those people had! So good for my children to hear, to realize how easy they have it. I love this pouring of truth and beauty into their hearts. That’s what any great book should do. We talked about this very thing at my last book club, and I think this is one requirement for a great book, for me anyway, that it makes you want to be a better, stronger person. And if it can show you someone as an example, all the better. I love my children hearing how Laura struggled not to cry (with her only doll torn apart and her father gone) because it was “shameful for an eight year old to cry” and hope a bit of that sinks in. Not that they can’t cry, but my children tend to cry if someone looks at them the wrong way. We can do with a bit more stoicism around here. Laura and Mary bravely bring in the woodpile before an approaching blizzard while their parents are gone, and they have to, otherwise they will “have to burn up the furniture, and maybe even then will freeze stark stiff.” Sheesh. And my kids complain when I make them eat beans. If you’ve never read On the Banks of Plum Creek, get it! Get it today! Get thee to thy library website, request it on CD, and listen to it the next time you get in your car! It’s one of the best. This entry was posted in Homeschooling and tagged chapter book, Homeschooling by Charity Hawkins. Bookmark the permalink. Great post. I’m reading Plum Creek right now as its one of my favorites. This series is great on audio. I enjoyed reading your post. I’m hoping my niece and my son will love these books as much as I do.